M. Riccardi-Cubitt, Le Cabinet, Paris, 1993, p.
C.I.N.O.A. International Art Treasures Exhibition, Victoria and Albert Museum, London, 1962, Catalogue, no. 153, fig. 110. The changing taste and refinement of 18th Century France challenged both the marchand-merciers and the ébénistes to satisfy their evermore demanding clientèle. The use of oriental lacquer and Sèvres and Wedgwood plaques to embellish furniture was highly fashionable. More unusual is the use of verre eglomisé panels as on this secretaire or in combination with birds' feathers and butterfly wings as on the cabinet intended for Louis XVI's pièce des bijoux at Versailles made by Weisweiler and Benneman about 1788. The use of such verre eglomisé panels is mostly associated with Weisweiler and his close working relationship with the dealer Daguerre implies that such pieces were intended to satisfy particular orders and not for stock. Such pieces, primarily made between 1788 and 1792 include a Louis XVI bureau plat sold from the estate of Hélène Beaumont, Sotheby's Monaco, December 4, 1992, lot 7, and a Louis XVI secretaire en cabinet at Schönnbrun Palace, Vienna. Both are stamped by Weisweiler and have the same green-ground indicating possibly that they were part of the same commission. The use of verre eglomisé is generally also associated with Sèvres, or Wedgwood bisuit plaques. The 1788 French edition of Wedgwood's catalogues includes plaques of the same subject as on this secretaire of 4in. (10cm.) diameter entitled sacrifice a l'Amour no. 169, and sacrifice à l'Hymen no. 170. The limited variety of plaques explains why each is repeated on one piece of furniture. Both of these subjects appear on pieces in the Louis XVI Sèvres service and the Sèvres Factory registers between 1775 and 1783 entitled offrande à l'Hymen and offrande à l'amour (see G. de Bellaigue, The Louis XVI Service, London, 1986, pp. 244-245). A secretaire en cabinet by Weisweiler sold Cheverney, April 25, 1993, lot 145, mounted with a rectangular Wedgwood plaque, is similarly decorated but in painted tôle. The paintings on a red ground on this secretaire are remniscent of the work of Dominique Dugourc who worked with F.J. Belanger in the design and decoration of the château de Bagatelle for the comte d'Artois in 1777 (see D. Alcouffe et al, La Folie d'Artois, Paris, 1988, p. 121). The architect François-Joseph Belanger (1744-1818) drew a design for a console decorated with four cameos in 1785-86 probably for M. Baldart de Saint James, trésorier général of the Navy (Hemitage Museum inv. 3264). Saint-James was declared bankrupt in 1787 and his assets were auctioned that year. The list compiled when the goods were seized shows un secretaire de femme en bois peint et verni arabesque garni en bronze doré, balustres ouvert et ride, 360 livres. Two secretaires de bois des Iles peints en ornaments are recorded in Madame Dervieux's hôtel (see above) which was decorated by Belanger. The doors of the Dining Room (formerly in the Greffulhe Collection) were decorated with arabesques and allegorical vignettes in the manner of Belanger's brother-in-law J.D. Dugoure. The bedroom was decorated with putti on horseback. 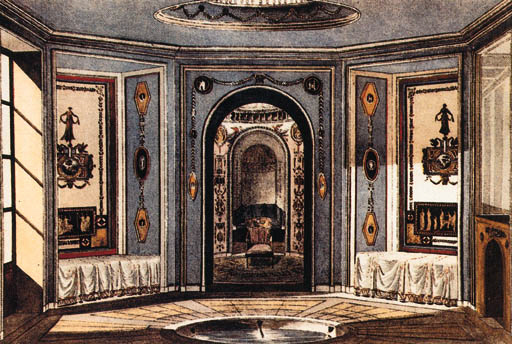 The bathroom, which was engraved by Detournelle in 1790, was painted with figures from antiquity on a Wedgwood blue ground. The decorative motifs used on this cabinet are similar to those other works by Alexandre Delatrìere who worked with Daguerre and Weisweiler at Bagatelle and Carlton House. The great jewel cabinet made by Schwerdfeger in 1787 for Marie-Antoinette at Versailles is also decorated with verre eglomisé panels decorated with similar arabesques by Degault. Designed by J.D. Dugourc, it is on display at Versailles.